The original reference to the vertical occipital fasciculus was published by Carl Wernicke in 1881. The dashed blue lines outline where Wernicke located the region. Jason Yeatman and Kevin Weiner found the illustration in Lane Medical Library. What started a few years ago as a brain-imaging study turned into a scientific mystery that eventually ended in the basement of Stanford’s Lane Medical Library, within the pages of a book first published in 1881 and last checked out in 1912. That journey, published this week in the Proceedings of the National Academy of Sciences, revealed the long and contentious history of an otherwise innocuous tract of nerve fibers of the visual system, running from just below to just above the ear. It also revealed the many ways scientific knowledge has been gained and lost over the centuries, and in some cases written out of history through a combination of scientific in-fighting and, at times, poor record-keeping. The journey began when then-graduate student Jason Yeatman, co-first author of the recent paper, was carrying out brain-imaging studies to better understand how kids learn to read, in the lab of Brian Wandell, a professor of psychology. Yeatman noticed that all the brain images in his study contained a structure that didn’t appear in any texts. Either he’d discovered a new brain pathway or someone else had discovered it first, but the discovery and researcher had been lost to history. Kevin Weiner, a postdoctoral scholar and co-first author on the paper, had been working with Yeatman on the imaging studies. Weiner, who is in the lab of Kalanit Grill-Spector, associate professor of psychology, said that he had long been interested in science history, and this mystery piqued his interest. “Jason and I decided for our own curiosity to understand what happened to this pathway,” said Weiner, who is also director of public communication at the nonprofit Institute for Applied Neuroscience. A few factors could be the cause of brain structures being discovered and forgotten. 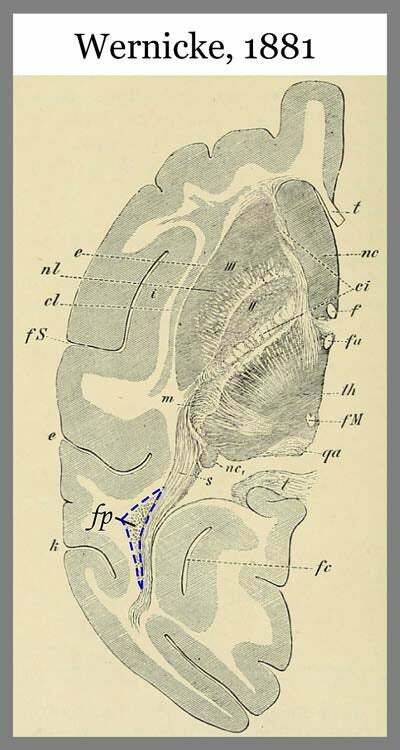 In the late 1800s and early 1900s, Weiner had learned, the roughly 30,000 names of brain structures in various languages were consolidated into a list of 4,500 as part of an effort to create a universal nomenclature. “In trying to make it easier to remember names, some got written out of history,” Weiner said. In this case, consolidation wasn’t the reason for the region’s disappearance from the literature. The region was the source of controversy between its discoverer, Carl Wernicke, and his adviser, the influential neuroanatomist Theodor Meynert. Meynert strongly believed that all of the brain’s association pathways ran from front to back – horizontally. But the pathway in question, which Wernicke had called the vertical occipital fasciculus, or VOF, ran vertically. Although Yeatman and Weiner found references to the VOF under a variety of different names in texts published for about 30 years after Wernicke’s original discovery, Meynert never accepted the VOF and references to it became contentious before eventually disappearing entirely from the literature. Although the VOF disappeared, Wernicke’s publication of its discovery still existed in Lane Medical Library, where Yeatman and Weiner eventually tracked it down. Both Yeatman and Wandell said this work also highlights the value of modern techniques for reproducing results. No longer can a field simply disregard findings that don’t fit a prevailing idea. “Now we can record our methodologies and software algorithms to be distributed with our papers, allowing any researcher in the world to reproduce our results,” Yeatman said. The idea of sharing data to speed scientific progress is a cause Wandell has championed at the Center for Cognitive and Neurobiological Imaging, which he directs, and that he has been promoting in his work helping the Stanford Neurosciences Institute plan the computing strategy for its new facility. With shared data and labs worldwide attempting to reproduce published results, the teams said it is less likely that modern neuroscience findings today will be lost due to differences of opinion over a discovery’s relevance. The brain imaging that resulted in the rediscovery of the earlier work was funded by the National Science Foundation and the National Institutes of Health. Additional authors include research associate Franco Pestilli and postdoctoral scholars Ariel Rokem and Aviv Mezer.